Multiple vehicle car accident claims in California are frequent due to the sheer volume of traffic traveling along busy corridors like the major freeways of Southern California including the 405, the 5, the 110 and other similar arteries of travel with up to 6 or 8 lanes going in any one direction and hundreds of thousands of vehicles traveling side by side especially during the rush hour commute. These claims can be tricky from a liability standpoint and from an insurance claims processing perspective. When three or more motor vehicles are involved in a crash, the “finger pointing” becomes such that these claims can often not be settled without litigation to ferret out the exact cause or, more likely, causes of the crash and the legal responsibilities of the various drivers involved. Let’s face it, the vast majority of our urban areas in California have major freeways with multiple lanes of travel. As more and more traffic congestion prompts further lane expansions, lanes get more numerous and less wide. This leaves little “margin for error.” Often times, vehicles follow each other too closely, stop too suddenly, or change lanes without signaling or too rapidly for other drivers to react which, in turn, can cause crashes between three or more motor vehicles. It only takes one driver not traveling at a safe speed or distance to initiate an abrupt stop, slow down or lane change and cause other cars to either rear end that vehicle or veer into another lane of travel and cause a chain reaction. Oftentimes, weather including rain and slick roads compound these “split second decision” factors in causing these crashes. In addition, the size and weight of vehicles plays a large role in causing these crashes between three or more vehicles. For example, 81 percent of fatal crashes involving big rig tractor trailer trucks are multiple-vehicle accidents according to the National Highway Traffic Safety Administration. (NHTSA,Traffic Safety Facts – Large Trucks, 2012). 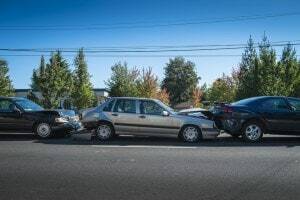 What Does California law say About the Legal Responsibility of the Various Drivers Involved in a Multi-Car Pile up Traffic Collision? As I have discussed many times elsewhere in this blog, California is a “comparative fault” state with regard to tort liability and negligence. This means that the “trier of fact” (judge or jury) awards damages to those persons according to their degree of fault in any particular situation. If there is fault on the part of the plaintiff, the trier of fact is allowed to reduce the award of money damages by that percentage of fault. Likewise, any and all persons who contribute to the accident and are a “substantial factor” in causing harm are liable. California law defines “substantial factor” as follows: “A substantial factor in causing harm is a factor that a reasonable person would consider to have contributed to the harm. It must be more than a remote or trivial factor. It does not have to be the only cause of the harm.” Judicial Council Of California Civil Jury Instruction 430 (emphasis added). Therefore, each and every driver who contributes in any way to causing a multi-vehicle traffic collision can be held legally responsible for payment of damages including present and future medical expenses, lost wages or the value of lost earning capacity for permanent physical or mental disability, “general damages” for physical pain and mental suffering related to the bodily injury sustained, and property damage. It doesn’t matter how slight the actions or inaction of the motor vehicle operator was in contributing to the wreck so long as they are “more than remote or trivial factor(s)”. As I have also discussed, ad nauseam, in my blog posts, auto insurance carriers do not willingly or freely pay out claims. Insurance claims adjusters will always try to find fault on the part of the person claiming injury or some third party. This becomes particularly acute in multi-vehicle accident claims. Often times arguments will be made that “driver 1 says he or she only felt one impact, not two” or “driver 2 doesn’t recall being pushed into driver 1 by driver 3.” The problem is that many insurance adjusters want to use this an excuse to deny the claim outright when, in fact, the proper legal analysis should be one of comparing the fault of various parties and determining an apportionment of fault among them. Without a California injury lawyer familiar with freeway pile up crashes and willing to conduct the proper investigation and make the right arguments, the injured party is at a distinct disadvantage in trying to negotiate an adequate settlement of this type of claim. Oftentimes, the insurance representatives cannot agree on percentages of fault without the filing of a lawsuit, deposition of the parties, and other formal discovery into the facts of the case. Sometimes, accident reconstruction experts will need to be employed to try to recreate the exact sequence of events. Without this level of analysis, these claims often settle for pennies on the dollar of what they are worth and claims are never pursued against all of the potential, responsible persons. All of these factors make it crucial to seek out the help of an attorney! For more information on any multiple vehicle accident claim anywhere in California including a free contact us of the facts of your particular situation, call toll free statewide in California (including San Diego, Los Angeles, and the Inland Empire or anywhere else in the Golden State) at 866-966-5240.